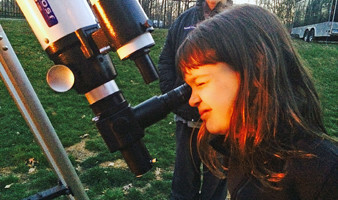 Last night the Astronomical Society of New Haven held a observing session at Camp Meechiemuk in Marlborough, Ct. Meechiemuk is the only state wide sleep away summer camp for HIV/AIDS affected children in Connecticut. Organized by Hispanos Unidos, Inc., the purpose of the camp is to provide respite care to parents and/or guardians. 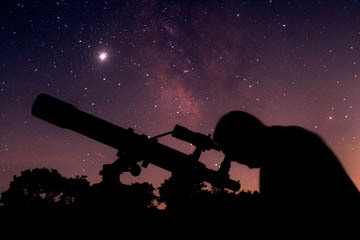 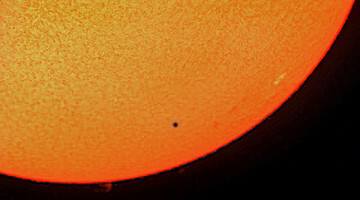 Over 60 children spent the better part of two hours observing the planet Jupiter, and many Messier objects. Below, is a photo that I took of one of the participants enjoying the Marlborough skies with the Milky Way in the background.